I’m not entirely sure what it was about these three pieces that tie them together under that title, even before hearing the first piece on the program. Some things, though, never change, and that’s so comforting. 19:30 pm, the chatter from the audience dims with the lights, stage lights go up, doors open, performers appear to applause, that whole five minute procession that ends with tuning and the appearance of the maestro, who is in this case not 呂紹嘉, but 余隆, a pretty famous dude. But that’s kind of where things changed. Instead of giving a downbeat to an orchestra, lights go back up and there comes more chatter from the audience, amplified chatter, featured chatter. 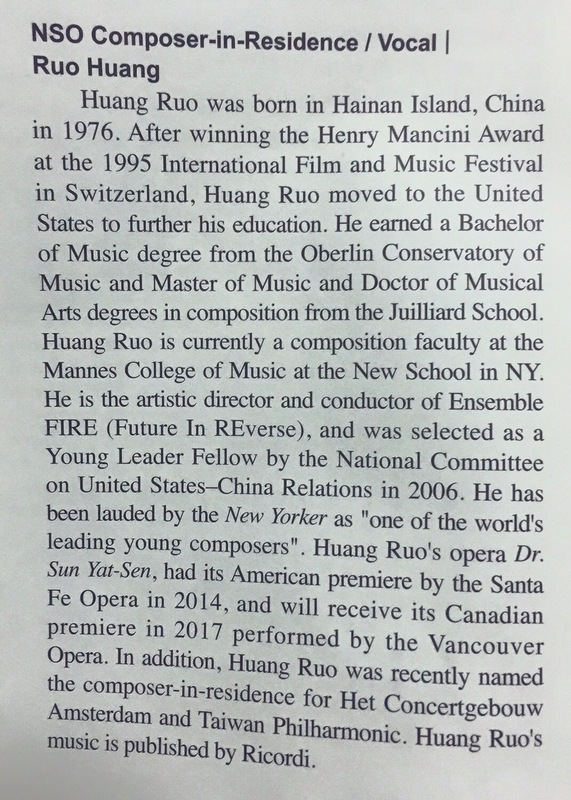 It was 黃若 himself, the composer of the first piece on the program. It was what I’d describe as ‘Pacific Island yodeling,’ and went on for close to a minute before I realized he was actually standing in the audience, on the floor below the balcony where we were sitting. 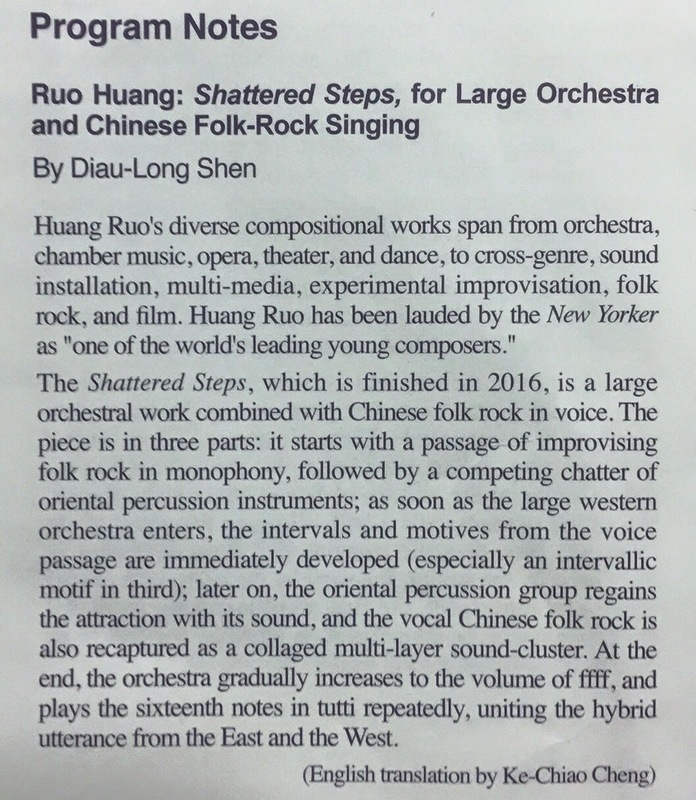 The program notes mention “a passage of improvising folk rock in monophony,” but I’m not sure how improvised it could be, since the orchestra jumps in and later develops the content, but only after a wash and clang of percussion. The piece lasted not more than ten minutes (I actually have no idea how long), but a unique large orchestral section from a very large orchestra plays similar material to the very Chinese/Asian beginning in a manner that sounds as if Alfred Hitchcock had asked for Balinese folk musicians to collaborate with Bernard Herrmann on his movie scores. The vocals were later looped into the closing section (or re-sung over the orchestra) and the piece ended. I’ve expressed my thoughts about ‘fusion’ just about anything. Interesting ideas, but for me, in most cases not convincing. I had been thinking during the piece about expectations, and what’s right or appropriate or suitable for the concert hall, and how that sounds elitist or stuffy, but not really. I love a good PB&J with a glass of milk, like, quite a lot, but if I’m going to a fancy restaurant, I expect something different. It was an interesting piece, and my fellow concertgoer said he enjoyed hearing the textures and sounds of so many different percussion instruments. Good point. Next was, for me, the feature, Shostakovich’s first cello concerto. I’d shared this work with a few people and found two recordings on YouTube (or listened to; there are far more than just two), from M. Rostropovich and Sol Gabetta, the former quick and intense but an older recording, the second slower and intense and a higher quality recording. I’m used to hearing the piece played at a faster, more frenetic pace, but last night with 王建 was, shall I say, more languid, at least at the beginning. From the very beginning I was left hoping there’d been a bit more nervous energy, passion, drive, but once the piece got going, there seemed to be a different kind of intensity about the piece, one that worked just as well, but almost worked in conflict with the almost harried nature of the cello solo. Perhaps this is the often-present issue of the guest conductor, who might not know the ensemble well enough to put the pedal to the metal and push the orchestra. In any case, once the ball got rolling, the piece was engaging, chilling, haunting, as it should be. The second movement was sweet and lush, the cadenza breathtaking, and chills ran through me in not a few places. Many parts seem to me to be quite introspective for the player, in contrast with how frighteningly virtuosic the work is, and that was very interesting two watch. As encores, we got two separate movements from the Bach suites, a somehow very fitting accompaniment to the Shostakovich work. I tried to explain to my fellow concertgoer why I felt they went together so well, but couldn’t. There’s something about the depth or intensity of the atmosphere they both convey, but at the very least, it was nice to walk out of the concert hall for the intermission having cooled off from the tension in the Shostakovich. Strauss. Big orchestra. Organist. Lots of brass. Double basses. Thus Spoke Zarathustra. While everyone knows the opening of this work now thanks to Stanley Kubrick, the piece is actually like a half hour long, in nine sections. I haven’t listened to this work in I-can’t-tell-you-how-long, but it definitely sounded Strauss-y. I’d love to hear Eine Alpensinfonie or Don Juan, but this work was obviously the feature of the program, Strauss’s declaration for his love of Nietzsche and his Zarathustra. The music sounds philosophical, either from its density and complexity, or… I don’t know. It’s a piece I’m not very familiar with, but all the contrasts were there, the bigness and smallness, the solos, the roar of an organ, but when pitted against things like even some of Strauss’s later work, or symphonies of Mahler of the same period, it isn’t as all encompassing as one might have felt at the time. It’s also a piece that ends quietly, making the audience apparently slightly hesitant to burst into applause at its finish, as was done with Shostakovich. The lady sitting next to me, who often does when I sit where I sat last night, said the Strauss piece was the reason she attended, but I left too soon after the end of the concert to pick her brain about the work. Maybe next time we’ll get the Alpine Symphony, but I’m not complaining. It was an enjoyable concert. What I’ve been preoccupied with lately is seeing what’s on next season’s roster. I can’t wait to see the programs!! !